Today I finally took Dim's and others' advice, took a day off work and brought home this for winter fun. Also, that's probably the cleanest it will ever look. Looks like you must be in trouble for bringing home another bike. 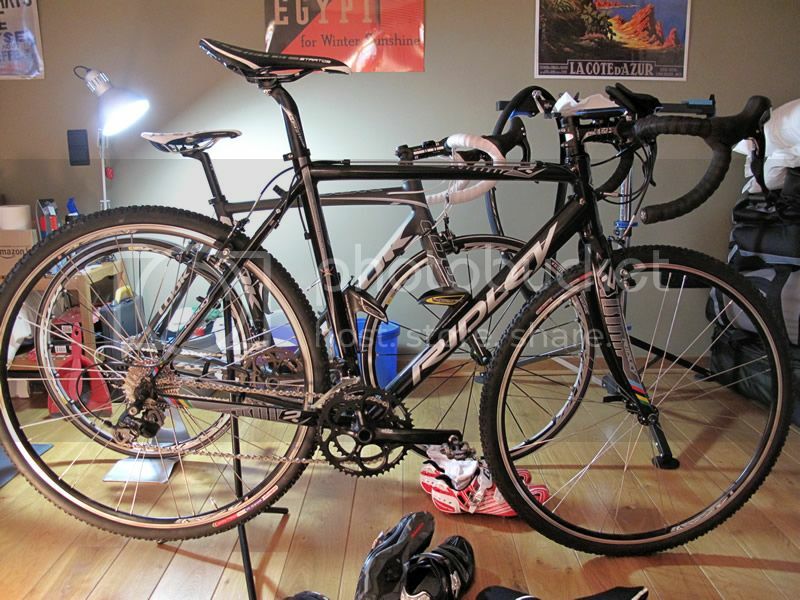 sleeping in the bike room?? Mrs L'arri's pretty cool with it actually. The ground was prepared though: I had already let her set up a glass kiln in the apartment. I went out on it today. I was pretty weak after a vaccination shot I had on Friday completely wiped me out yesterday so I planned a 52km ride and actually only rode about 10km. Spent much of it zooming around the park, menacing the Sunday strollers and worrying their dogs. Bloody great ride: unbelievably nimble at the front end, which I was really surprised about (although to be fair I've never ridden a CX bike before). A little sluggish on the road, but you'd expect that of course. This is my first pair of SPDs too, and those pedals feel so insubstantial, but I'm getting used to them. Tour de Shawn - My personal cycling blog! Strawberries and cream on the legs there, Shawn. Be careful in that sun, man! I've no such worries. The sun almost never shines on the flat countries of northern Europe. I have to buy daylight bulbs just to keep from getting depressed. Here in the Midwest America, we get our fair share haha. We just went through the worst drought in my 28 years of existence, there was a lot of sun involved in that one. I used to hate the sun though and always remained pale. Now I get in it every chance I get..
My new bike, S-Works Tarmac SL4 with SRAM red. That's my first encounter with SRAM products. I have now tried all 3 systems (Campy, Shimano and SRAM). I think Shimano is the best. Very smooth shifting and the most reliable. Hey nice machine, what saddle is that? I did a (very short) test ride on an S-Works Tarmac at my local bike shop some years ago, with Shimano I think. 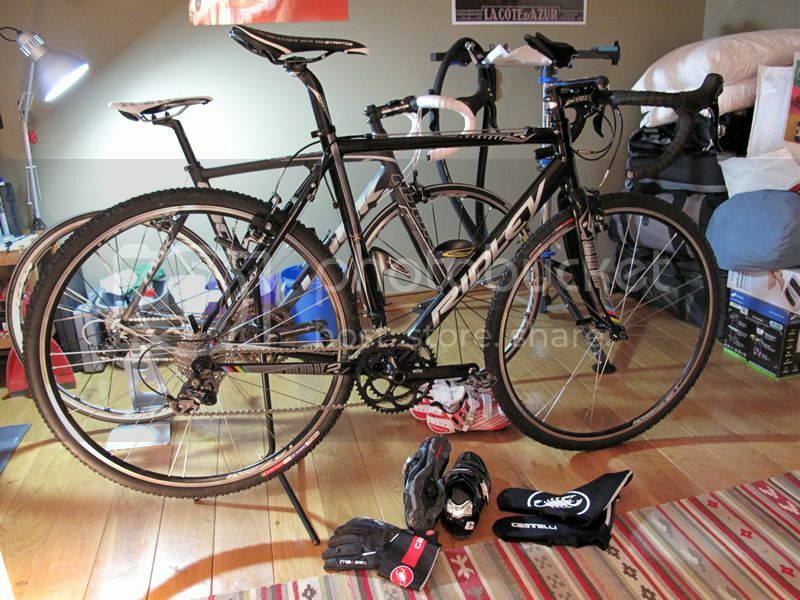 Absolutely a great bike, but too aggressive for me - and out of my price range, in any case. On the gear systems, I'm biased as I've had Shimano Tiagra on my first, entry-level bike (it worked, I guess), then exchanged that (and a fair bit of cash) for my current bike - with Campagnolo Veloce - after only 3 months. Haven't looked back since. Even I can adjust the gears without problems if need be, and I have no technical knowledge to speak of. But that's a personal and, as I said, biased opinion. I slide around in them a lot but they're generally easy to get into and the cleats go great in the mud. My Gaerne Inkas, which I bought for winter riding, are nice and stiff on the sole but offer almost no heel support in comparison with my Gaerne road shoes which are bags better. This was a first for me and without heel support I felt almost naked, strangely enough. But I got used to them and they're really good shoes. Can we see your bike though, AG? You know, in the flesh, not the official vendor's picture of it. Something arty next to the lake maybe?